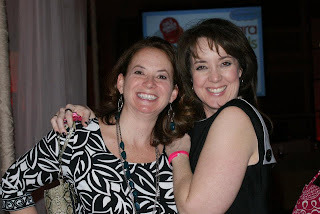 This year's BlissDom conference was a much different experience for me. In 2010, BlissDom was my very first conference. I went alone, daring to room with someone I had never met in-real-life before. In 2011, I spoke on the legal panel at BlissDom. This year, I was Staff. A Bliss Chick. Involved in the behind-the-scenes planning, weekly conference calls, and (addicting!) Skype chats. I loved every.single.minute of it, no lie. The heart, soul, love and work that goes into this conference is astounding. Just know that. And yes, I was the gal with sparkly tinsel in her hair. If you were in any of the Life Development tracks over the course of the 2 conference days, you likely saw me in the back of the room. Holla! BlissDom '12 was different for me in that it took me out of my comfort zone. I HAD to be there. Present and accounted for, with a helpful smile on my face at all times. Welcoming. Open. Friendly. If you know me, you know that this isn't my natural state of being. I am usually sarcastic and snarky. I have a bite to me. It's a northern thang. But the more talkative and friendly I was over the course of the conference, you know what? The more it felt good. Natural. Easy. Jennifer, my fabulous roomie for 3 years in a row now. And Carmen. Sweet, sweet Carmen. For me, BlissDom is all about the relationships. The new, the old, the possible, the potential. This year's conference secured, for me, the knowledge that I am doing what I am supposed to be doing. This "hinge moment" came for me in between sessions. Amber and I were standing in the back of the room as a new session was about to get started and Alli approached us. Putting an arm around each of us, she asked, "Can we just take a moment and soak this all in, you guys? YOU did this. YOU." I actually teared up. Validation. Fulfillment. Acceptance. Acknowledgment. You guys, I almost quit writing this past fall. Was gonna shut this blog down, never to be heard from again. Yet I couldn't bring myself to push that delete button. Being involved in the planning of BlissDom with the Bliss Chicks renewed me. Gave me hope. Fed my soul. Made me realize that I couldn't possibly drop out of this blogging community that I love. That is now a part of me. I'm so glad I didn't quit. I am doing what I am supposed to be doing. With my family. With my career. With my blogging. With my life. The best Welcome Home Committee EVER! I teared up to be included in your tribe. This year definitely pushed me out of my comfort zone, too. It was a good thing. I loved your tinsel hair!! So nice to see you. I am so glad to have met you & also to have been a community leader. This year did not push me out of my comfort zone but rather I felt like I FOUND my comfort zone. I live for helping other bloggers so to be involved in the small way I was felt so right. :) I would love to be staff some year but def. want to be community leader again! :) Great job & awesome conference you put together!! This is so great. I love how you stepped out of your comfort zone and became such a big part of Blissdom (even though I didn't go). Hearing (reading) that you almost quit and just couldn't do it and knowing where you are now gives me hope that I can succeed at this, especially after my first failed attempt several years ago. I don't think we actually met, but I'm sure we passed each other between meetings. "For me, BlissDom is all about the relationships. The new, the old, the possible, the potential. This year's conference secured, for me, the knowledge that I am doing what I am supposed to be doing." is EXACTLY how I feel. It wraps up my thoughts and feelings from just how amazing this conference is. Thank you for putting it into words. Im so glad you had that hinge moment. I could feel the emotions before I saw your words, I know how I would feel in that moment. Im glad we got to meet, if just for a minute on Saturday night! So glad that you didn't quit writing. I've had those moments as well -- and often it is an event like this or encouraging words that help bump me back into writing and the push to keep going. I was blown away at how amazing Blissdom really was -- this was my first time attending -- and I for sure will be back! WHUT? You almost quit?! NOOOOO! I mean, I don't make the rounds regularly, but you're one of few I actually know in real life and NOOOOO! I got all goosebumply reading today - knowing that you're a hard working momma - and manged to find your bliss in the midst of all the chaos. Go You. I'm so glad we met! Being a CL for my first Blissdom was such a blessing. I very easily could have stayed in my room and watched television if I hadn't been pushed out there. I'm so glad I had such nice pushers! Or something. Also? Would you like a card? I've got a few left. I'm in tears. Happy, Happy tears. I'm so glad you went, too and that it was such a positive experience for you. Oh my goodness.... I NEED to get to Blissdom. Next year, I am going come hell or high water. So happy you had such a good and productive time. I'm glad you didn't quit. I was more involved as a Community Leader and it really MADE my conference! I wish I would have found you there! I am at a crossroads with my blog, and Blissdom really forced me to confront a lot of the issues I am struggling with. I am glad you didn't quit, but I wish I was able to find time to talk to you. I think it would have been a great conversation. Love the last picture! !